An ignitable hazardous material is anything that poses a fire hazard during storage, handling or disposing. Ignitable hazardous waste storage can be very dangerous if not properly maintained. The immediate danger of ignitable hazardous waste storage is the spreading of particles over a wide area, and threat to the surrounding areas. Toxic materials are those that may release toxicants into the atmosphere and surrounding areas to pose a substantial hazard to individual’s health. Exposure to large quantities of hazardous waste storage can cause injuries and even hospitalization. Reactive hazardous materials tend to react vigorously with other substances, including air or water. 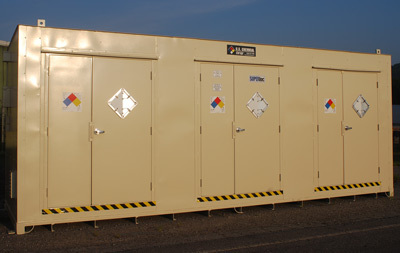 Reactive hazardous waste storage must be stored compliantly, as with all chemical storage. Reactive chemicals must be thoroughly researched before storing with other chemicals. Reactive hazardous waste storage can be very dangerous and separate storage containers may be used for containment. Partition walls may also be used for segregated storage techniques. Corrosive materials can “eat through” other materials. Corrosive materials can dissolve other substances, solids or liquids, and if stored improperly can eat through the chemical storage container. Corrosive hazmat is very dangerous and needs to be handled very carefully. Corrosives must be stored properly and compliantly. Not one classification is allocated to one chemical. A chemical can contain all four classifications or just one hazmat classification.